Some very patient people, waiting for the title of the next Avengers film. Who among The Mandalorian’s list of directors could direct which episodes? Vincent D’Onofrio once again stokes the flames of his desire to bring Wilson Fisk to the Marvel movies. Get your first look at the Pet Sematary remake. Plus, what’s to come on the CW’s returning genre shows. Spoilers, assemble! Just what we’ll actually be calling Avengers 4 that isn’t “Avengers 4” has been the source of much debate since, well, before Infinity War came out. 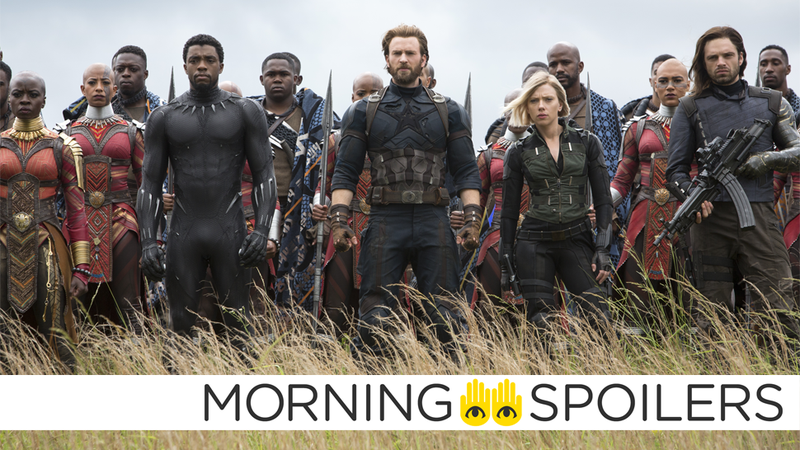 But MCU Cosmic now cites sources alleging that Avengers Annihilation—a parallel to Avengers Assemble, the comic book rallying cry of the team (and also the UK-only title of the first Avengers film). Take it with a pinch of salt, of course! Vincent D’Onofrio isn’t ruling out an appearance from the Kingpin in a future Spider-Man movie...but this is presumably just him once again saying he’d be up for it, rather than any actual concrete indication that he’s in the film. Entertainment Weekly has our first look at the Pet Sematary remake. Head over there for more rustic family drama. Black Manta’s costume is now on display at New York Comic Con. Meanwhile, Aquaman crests the surface in a new poster from Coming Soon. Alita puts on her war paint in the latest poster from Coming Soon. A poster from New York Comic Con (courtesy of Coming Soon) celebrates Christmas with improvised weaponry. Coming Soon also has an international poster for the Wreck-it-Ralph sequel spotlighting Gal Gadot’s character, Shank. A New York Comic Con poster illustrated by Todd McFarlane has been posted to the film’s official Twitter. The totally rad Anna Fang is profiled in the latest featurette. Following last night’s revelation of the official list of directors for the live action Star Wars show, Making Star Wars has rumors about who will direct which episodes. According to the site, Dave Filoni will direct episodes 1 and 5, Rick Famuyiwa is on episodes 2 and 6, Deborah Chow on episodes 3 and 7, and finally, Bryce Dallas Howard will take episode 4, leaving Taika Waititi to direct the eighth and final episode of the season. Brendan Fraser officially unveiled the Robotman costume at New York Comic Con. In order to track down Diaz (Kirk Acevedo) from inside prison, Oliver (Stephen Amell) realizes that will require aligning with an old enemy. Meanwhile, in Star City, Felicity’s (Emily Bett Rickards) attempts to root out Diaz are thwarted by Diggle (David Ramsey), whose allegiance to ARGUS now requires him to keep civilians like her on the outs. Realizing that she can no longer rely on her old team or old methods, a clear-eyed Felicity resolves to find a new way to go after Diaz. Someone’s erecting mysterious roadblocks in the synopsis for “As Above, So Below,” the third episode of season three. When a series of suspicious roadblocks threaten to delay the opening of the speakeasy, Veronica (Camila Mendes) enlists the help of Cheryl (Madelaine Petsch), Toni (Vanessa Morgan), Reggie (Charles Melton), Kevin (Casey Cott) and Josie (Ashleigh Murray) to ensure opening night goes off without a hitch. Elsewhere, Betty (Lili Reinhart) and Jughead (Cole Sprouse) follow different leads to learn more about the strange incidents going on in the town. Finally, some unwanted attention forces Archie (KJ Apa) to make a difficult decision about his future. Finally, mermaids throw down in what looks like the aquarium section of a pet store in a new trailer for Siren’s second season, premiering January 24.